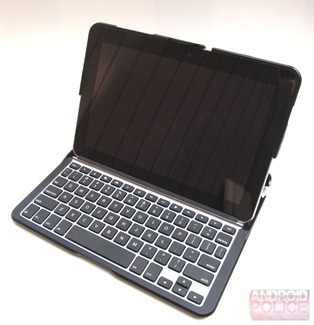 All bonuses aside, one of the core features of the Transformer's dock is, of course, the keyboard. 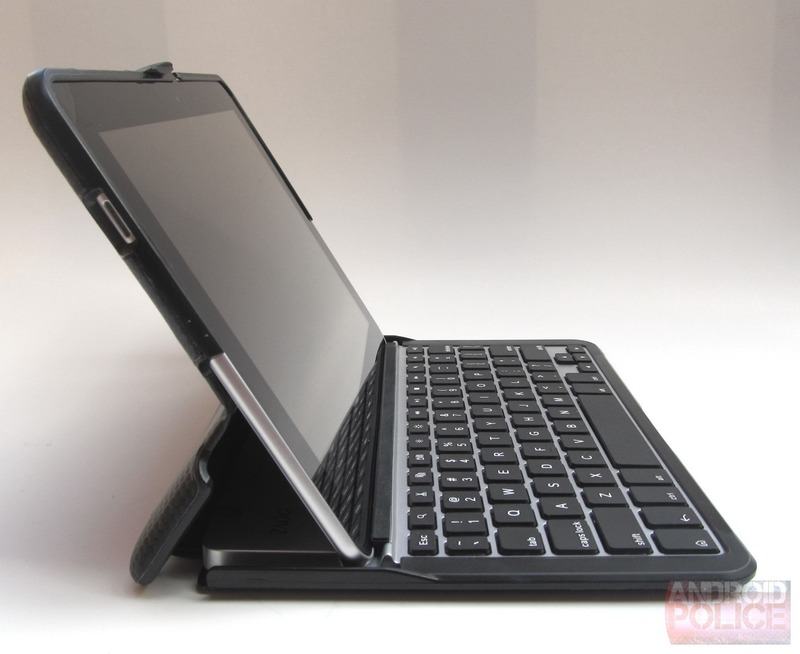 For web surfing, checking email, and light social networking, a keyboard-less tablet is fine. But for those of us who use tablets for more than that, a keyboard is almost a requisite. Artem and I have already given our thoughts on the official Samsung keyboard for the Galaxy Tab 10.1 -- both before and after the TouchWiz UX update. Still, the experience isn't great and the functionality is quite limited. 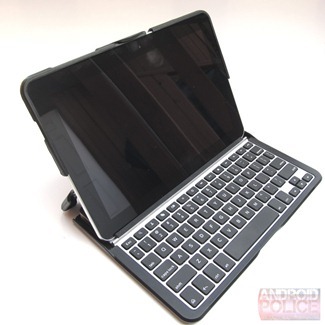 With hopes of curbing my Transformer envy, I snagged the ZAGGfolio case for the Samsung Galaxy Tab 10.1 (ZAGG.com, $99). 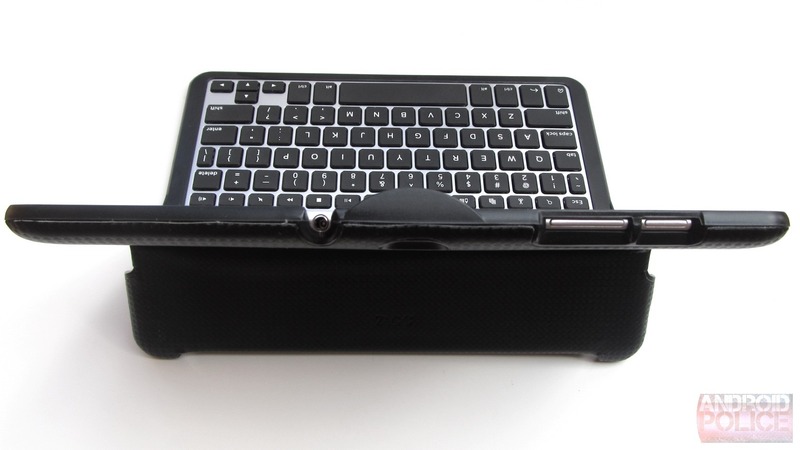 In a nutshell, the ZAGGfolio is a folio case (if you didn't already assume that from the name), with a removable Bluetooth keyboard. It's sleek, portable,and functional -- but it's not without its downfalls. Aesthetically, the outside of the ZAGGfolio case actually reminds me of the Transformer -- though whether this was done intentionally or not is a mystery. Either way, it looks quite good. The texture looks carbon fiber-esque, and it offers cutouts for all the necessary ports: headphone jack, power, volume rocker, both speakers, and the camera. The case itself is made of a hard plastic, so it's definitely not made to protect the device in the case of a drop, but, at the very least, it should keep it from getting scratched up. 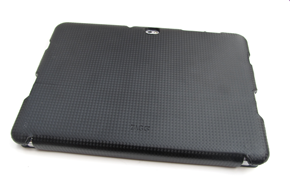 The inside is covered in a soft felt, which is nice, as it also aides in preventing scratches to the back and sides of the Tab. The case also features a sort of closure on the front, which keeps it from accidentally coming open and gives it more of a "laptop" feel. The Tab 10.1 fits in the case very snugly. In fact, for the first week or so, it was quite difficult to remove it once inside. As time goes on, though, it's loosening up a bit. Normally a case becoming looser like this may bother me, but in this situation, I think it's a good thing, as I often want to remove the Tab quickly and leave the case behind. Still, this brings me to the first negative of the ZAGGfolio: it may be too snug on the display when closed. The keyboard has a soft rubbery strip on the top (since the screen lays down on top of the keyboard) which leaves absolutely no room when the case is closed. In fact, it's so tight, that if you look at the screen right after opening the case, you'll see the Newton's Rings effect all across the display. The ring effect seems to disappear completely after just a few seconds, and while this hasn't caused any permanent damage to my device, it's still rather unsettling. As I mentioned earlier, the keyboard connects via Bluetooth. The pairing process is very simple, and I experienced no issues with that. Like other Bluetooth devices, once it's paired, it will automatically connect whenever it's in range of the Tab. Typing on the ZAGGfolio is a pleasant experience... for the most part. 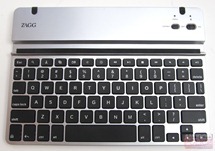 The keys are a bit crowded, but that is to be expected on a netboook-sized keyboard. Despite it's small size, it's quite easy to adjust to typing on it. 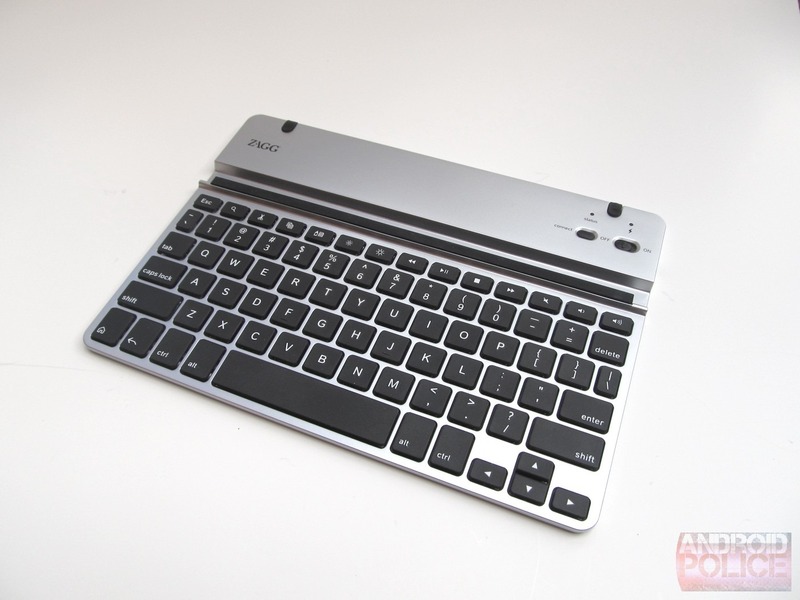 Its chicklet-style keys feel great -- very responsive and tactile. It has shortcut keys for some useful (and some not-so-useful) tools: search, cut, paste, clipboard, brightness, media controls (back, play/pause, forward, and stop), mute, volume up, and volume down. The rest of the keys are pretty standard -- aside from the backspace key, which strangely (and annoyingly) says "delete." The backslash key is also unnecessarily small, so it's quite difficult to hit. Still, the overall experience of typing on the keyboard is pretty pleasant. While the keyboard may be easy to adjust to, it is lacking one serious feature: shortcuts. Yes, I did mention that it does have some dedicated keys -- but they're really not all that useful. 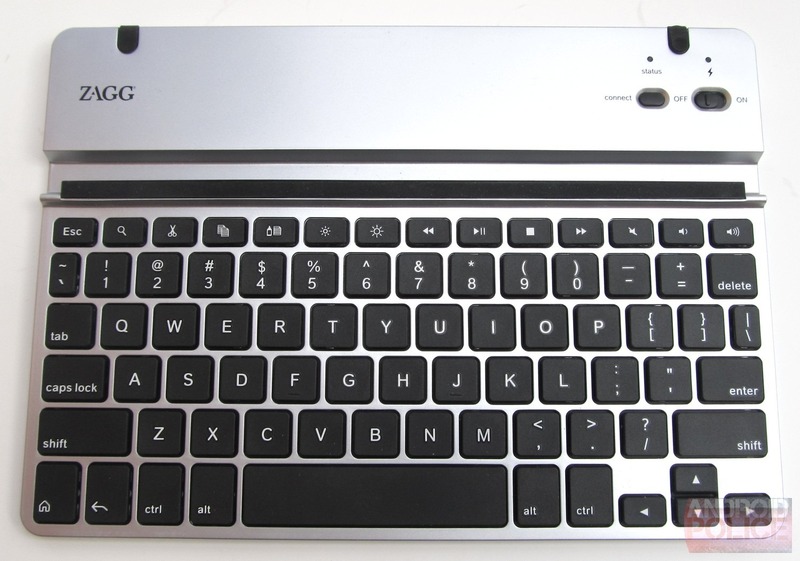 The Samsung keyboard has a whole slew of very useful shortcuts keys: settings, notifications, lock, app drawer, browser, email, soft keyboard toggle, etc -- all of which are disappointingly missing from the ZAGGfolio's keyboard. With the Samsung keyboard, you can almost use the Tab without touching the screen, which is something that I've gotten quite used to. 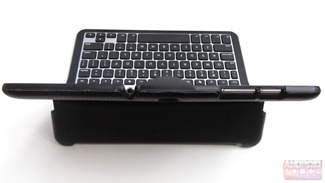 This is not the case with the ZAGGfolio, as it is lacking most useful shortcut keys. The keyboard has a groove cut in it where the Tab sits while in use. The angle isn't horrible, but I really hate the fact it's not adjustable. 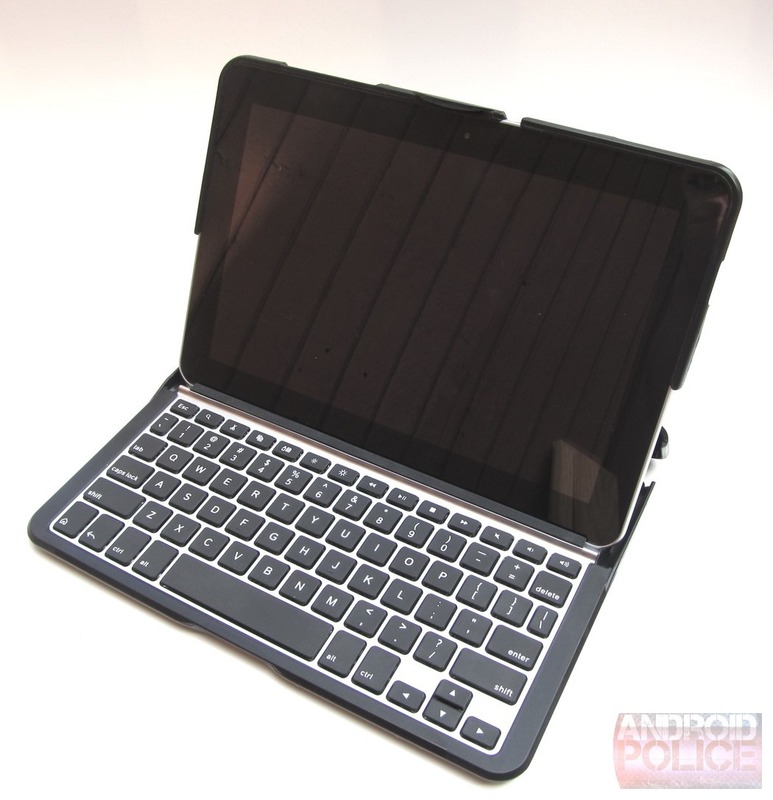 If you plan on using this in your lap, you might as well retire that idea right now -- it's nearly impossibly to comfortably use the keyboard in your lap while keeping the Tab stable. If you're using it on a table, however, it's not bad at all. Still, I find it much more comfortable to just remove the keyboard from the case, drop the Tab on a tablet stand, and use it that way. Another downside of this is that the Tab cannot be charged while you're using it in the keyboard, as it blocks the charging port. This isn't a huge deal since the Tab gets pretty solid battery life, but if you're trying to work on something and are running low on juice, it could be quite annoying. This is the most impressive feature of the keyboard by far. How impressive, you ask? I haven't charged it since I got it. Not even one time. It's still running off of however much battery it had when it arrived at my house... and it hasn't even hit 20% yet. I don't see myself needing charge this thing more than two or three times per year. That's nuts. Unfortunately, there is only one way to tell how much battery life is left: wait for the status light to start blinking. Once that happens, you have about 20% battery life, which, according to the included documentation, should last about 2-4 days. 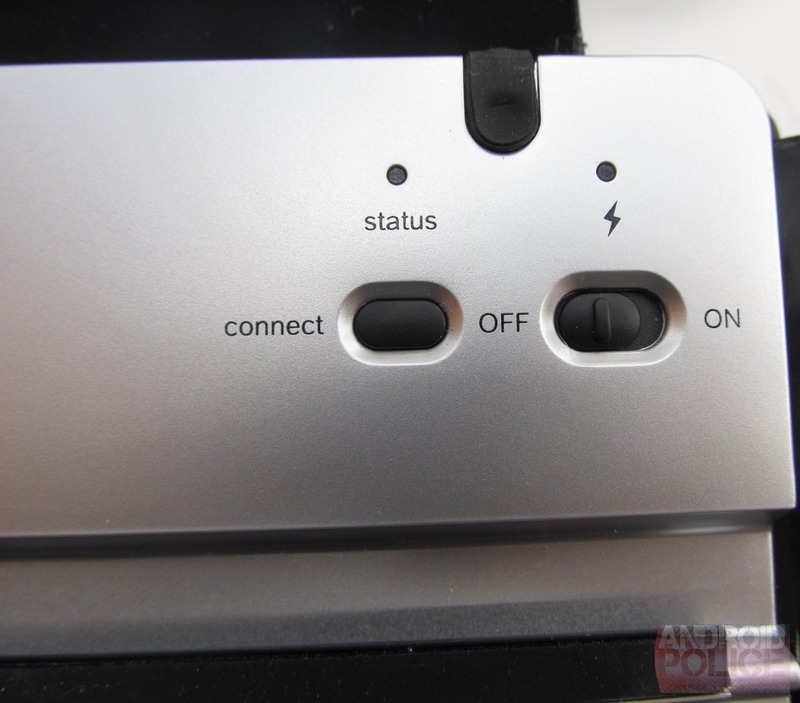 The bad part about this is that the status light is behind the Tab when it's "docked," so unless you periodically remember to check it, you won't know when the battery needs to be charged. The ZAGGfolio is a good case. It also has a good keyboard, but it also has its share of shortcomings. Aesthetically appealing and well made. 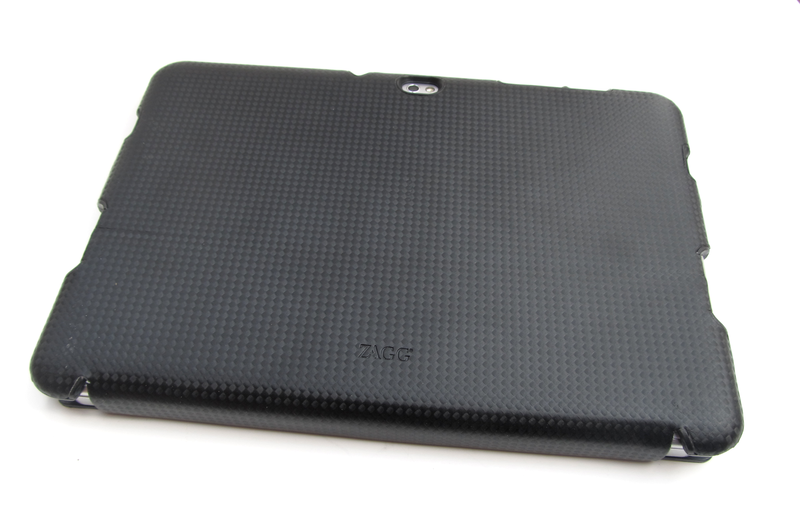 So, all things considered, can I recommend the ZAGGfolio? It depends. If you don't mind the lack of keyboard shortcuts and will never try to use it in your lap, then I can whole-heartedly recommend it. If, however, you want something that's a bit more versatile and comparable to the Transformer dock (or even the Samsung keyboard), then this probably isn't the solution for you.